Google Data Studio is a free online tool that lets you to customize visual reports using data from various sources. With a Business level SEMrush subscription, you can implement SEMrush data as a Data Source along with the other 150 sources of data available in GDS. This article will help you get started. There are 2 separate connection points from SEMrush; One for pulling data from Domain Analytics, the second for Position Tracking. Domain Analytics lets you research search statistics on any domain in the SEMrush database, and Position Tracking lets you track a custom set of target keywords. 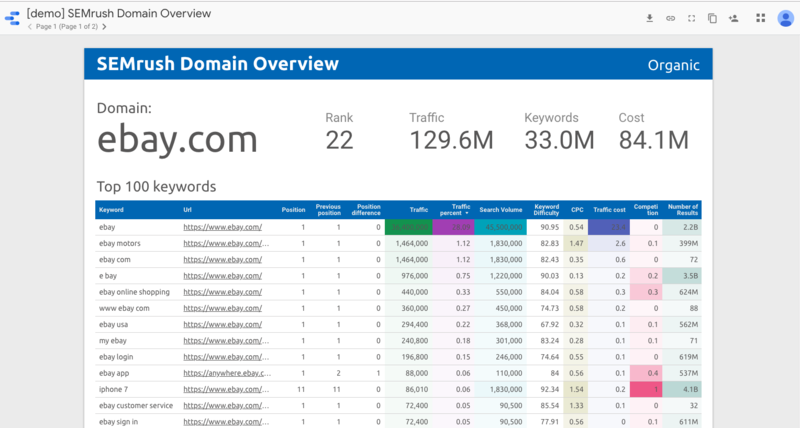 SEMrush Domain Analytics connector – to pull Domain Overview data including SEMrush Rank, top organic and paid keywords (Google Ads), and estimates of organic and paid traffic and traffic cost. Data is available for the most recent month only (historical data is not available). SEMrush Position Tracking connector – to pull Visibility, Positions or an Organic Overview report from an existing Position Tracking campaign. For additional help understanding connecting data sources to GDS, read this article from the Google Data Studio help center. The only difference here is that you cannot apply filters and sorting to your data source in GDS like you can using the SEMrush API. To configure the connection to SEMrush, you need to authorize both your Google account and SEMrush account to access data and add it to GDS. Select “Authorize” and “Allow” in the subsequent windows to make the connection. Domain Overview - this will pull an overview of the Domain’s search positions in the selected database. Organic Search Positions - this will pull information from an Organic Positions report about the domain’s top 100 keyword positions in organic search results. Paid Search Positions - this will pull information from an Advertising Positions report about a domain’s top 100 keywords related to their use of PPC ads on Google Ads. The regional database where SEMrush will look for the domain’s keyword positions. After completing these fields, select “Connect” and you will arrive at the next step where you can customize the arrangement of your columns. Select “Create Report” and you will be redirected to the Data Studio report builder where you can manually create the report that you want. 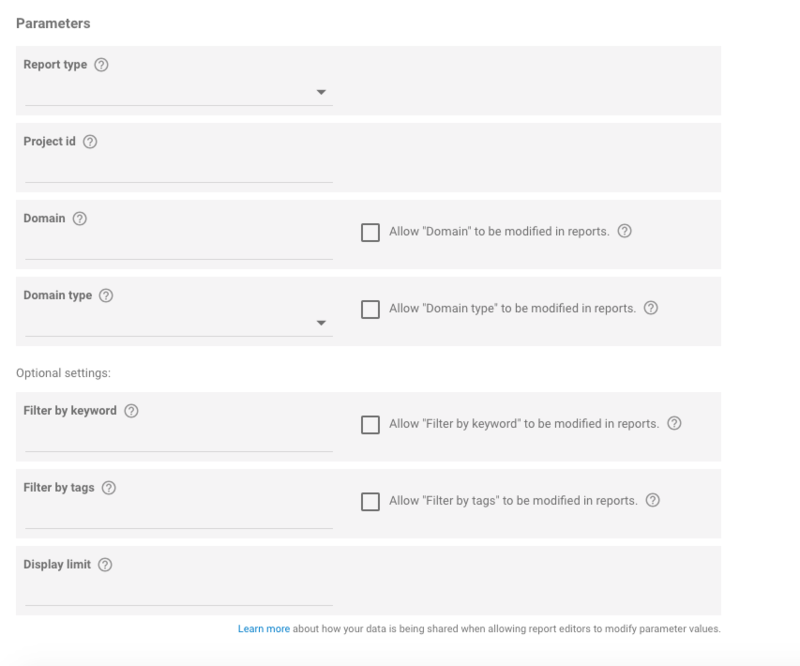 Your configured connection with SEMrush will be available to add to your report as a Data Source. Below is an example of what you could make with this connection. For help building your report, be sure to check out Google Data Studio's Help Center. This is the unique code associated with your Project. You can find it in the address bar when you are viewing your Project on SEMrush as the numeric code following the /projects/ folder. In the example below, the ID is 564987. Enter the name of the domain, subdomain, subfolder or URL you want to pull data for. This can be your main domain or a competitor’s. Choose root domain, subdomain, subfolder, or exact URL. Enter a keyword to filter the keyword list in your report. Enter a tag to filter the keyword list in your report. Multiple tags are allowed (separated by commas). The number of results to show in your report. The maximum is 1500 results. After completing these fields, you will be able to choose your data source’s columns and add this data source to your new report. We’ve created two example reports that are publicly available. Please feel free to check out our Position Tracking example report and Domain Analytics example report to see our data sources in action. These SEMrush Google Data Studio connectors are available only to users with a Business subscription. At this time, historical data is not available with this connection.